This MSR Access 2 Tent review is about the completely new winter tent series launched in 2017, suitable both for hiking and short backpacking tours as well as for 4-season use. MSR Access 2 Tent shown without the fly. This is a very lightweight tool for a winter tent. Multipurpose: features of a hiking and a winter tent. Crossed poles construction able to withstand overnight snow. This table clearly shows that the solo tent variant is the heaviest option (per person) as usual. Its surface to weight ratio is the smallest. The bigger the tent the bigger surface/weight ratio. So you have less weight per person as expected. Good to know when the participants share the elements of the tent. The difference in weight between the Access 1 and Access 2 is only 26 grams, yet the floor area is, respectively, 1.76 m² and 2.69 m². So the surface gain is no less than 0.93 m² plus you have one extra vestibule. On the other hand, the surface per person is, respectively: 1.76 m², 1.34 m², and 1.27 m². So the bigger the tent, the less space per person. Another thing to bear in mind is also the total vestibule surface. It is 0.84 m², 1.62, m², 1.62 m² for the three tents respectively. So again, the 3-person tent provides far less storage space per person. From these numbers, it makes a lot of sense using the Access 2 tent as a solo tent, in particular for relatively shorter tours in winter conditions when you need more space in the tent (because you are expected to spend more time than usual in the tent), or if you have your dog with you in summer time and you camp high in the mountains. This is a 2-person tent, but from the text above you realize it can be used as a solo tent as well, and you will have a castle in the mountains. In my text about winter tents, you can read about features of winter tents and their differences as compared to 3-season tents. Almost complete absence of mesh in the inner tent construction. Below, I am going to say a few words about these two elements. Normally 4-season tents have several poles, so the more intersections the better. This makes them heavier of course, but they are more stable. Well, here you do not have many poles, but there is one extra cross pole which changes a lot with respect to the tent stability. With such a structure, it can withstand overnight snow loading, but It should be stressed that this tent is not designed to be used in the harshest winter conditions. Well, here you do not have many poles, but there is one extra cross pole which changes a lot with respect to the tent stability. With such a structure, it can withstand overnight snow loading, but It should be stressed that this tent is not designed to be used in the harshest winter conditions. The poles used here are incredibly flexible and durable. MSR describes them as the most resilient tent poles ever made. You can bend them as you wish, they always return to their original shape. This is what makes an impression that this tent is weak, but in fact, it is just very flexible. This type of poles are now standardly used in MSR’s winter tents. This is a freestanding structure. The main pole is V-shaped at both ends (see the picture) and these segments fit into the tent’s grommets, making the tent freestanding. The extra cross pole adds extra stability and support, and it also pulls the walls up adding more volume in the tent. The poles and the inner tent are all visible here. The only mesh is a small triangle on the door. Many 4-season tents are without the inner layer. This is not so here, and this is what puts the MSR Access tents in the group between the winter and hiking tents. So you have an internal canopy which is 20D and durable water repellent (DWR). So eventual water that will condense on the fly (it always does), will not drop down on you, the canopy will keep it and eventually redirect it to the ground. There is only one small triangular piece of mesh on the top of the door, it is visible in the picture above. This, together with the mentioned extra cross pole is one of the features that makes it quite different from an ordinary hiking or backpacking tent. Such a canopy can probably make more than 10 degrees temperature difference, and this is huge. But bear in mind that this limits its use as a 3-season tent, you need the mesh for a better ventilation. However, when you are above 2500 meters in mountains, it can be terribly cold during the night, I have experienced this many times in the Alps. And at such altitudes, you can have all 4 seasons in one single day, again speaking from my own experience. So you would love to have such a tent even in the summertime. But the extra pole and the full canopy add to the weight, so this is not the lightest option on the market, but this tent is surprisingly lightweight for all what it offers. Note, this is only 4 lb 1 oz (1.86 kg) tent. So it is lighter than most of the mountaineering tents but at the same time warmer than an ordinary three-season tent. An ultra-lightweight fabric is used in other elements of the tent as well. So you have a 20D fly, and 30D floor, the DuraShield-coated fabrics, and taped fly and the bathtub floor. The tent is with two side-doors and you have two very useful vestibules which provide more than 1.6 square meters of covered space for your gear. Inside the tent, you have internal pockets at both ends and multiple loops on the ceiling to hang things. Multiple guy-out points outside on the fly allowing you to secure the tent against winds. The 3-sided MSR stakes are designed to have a good holding power in any ground. The poles are packed in their own sack, and this all together with the fly and the tent body comes in an orange sack with two compression straps with buckles. The packaged weight mentioned in the specifications includes the total weight of the packaged contents off the shelf. This is the only weight of interest to you, such a winter tent you will not be using in any other configuration. The minimum weight is the combined weight of the tent body, rain fly, and tent poles. So it does not include tent stakes, guy cords, stuff sack, etc. More about this terminology you can find in my separate text. The fly and the floor are with polyurethane coatings and all seams are taped. You have 1200 and 3000 mm for the fly and the floor respectively, which means that they withstand the given number of millimeters of a water column for more than one minute. This is enough even for a hurricane-force storm. Type: 2 person 4-season freestanding tent. Best use: for ski touring and snowshoeing in relatively protected zones near the tree-line. Minimum weight: 3 lb 10 oz (1.64 kg). Packed weight: 4 lb 1 oz (1.86 kg). Floor surface: 29 sq ft (2.69 sq m). 2 Vestibules surface together: 17.5 sq ft (1.62 sq m). Tent volume: 56 cu ft (1586 liters). Vestibules volume: 17 cu ft (481 liters). Interior peak height: 42 in (107 cm). Max inside width: 50 in (127 cm). Max inside length: 84 in (213 cm). Poles: 2 Easton Syclone. Note, even on the MSR site there is a wrong info, a statement about 3 poles. Rainfly: 20D ripstop nylon 1200 mm Durashield polyurethane & silicone. Canopy: 20D ripstop nylon & DWR. Mesh type: 10D polyester micro-mesh. Floor: 30D ripstop nylon 3000 mm Durashield polyurethane & DWR. Limited mesh on the tent body keeps in the warmth. Very easy setup even in windy conditions. Obviously, this is an expensive tool and there is nothing else I would add as my objection to this great tent. But winter tents are always more expensive than ordinary 3-season tent. *Note, this unique design includes the vestibule inside the tent, so this is the total covered surface. **This surface to weight (SW) ratio includes the total surface in this design. Doing the same for the Access 2 tent yields SW = 2.3. So there is no doubt, the Access 2 tent provides more comfort for 2 people. At the moment of writing this text, the prices of the two tents in the table are around $600 and $510, respectively. In conclusion of this MSR Access 2 Tent review, this tent is designed to fill the gap between true winter tents and backpacking tents. So it is very much suitable for relatively protected winter conditions close to the tree-line, and for high altitudes in mountains in the usual 3-season use. I am sure you will be able to appreciate its inner canopy at sub-zero temperatures in your summer camp high in mountains. The tent is not so suitable for ordinary 3-season use at very low altitudes unless you are able to keep the door open all the night. You might want to compare it with this Big Agnes Shield 2 Tent and also this Eureka Mountain Pass 2 which is a true 4-season tent. As I mentioned above, the series includes also the smaller solo tent presented in my separate text. 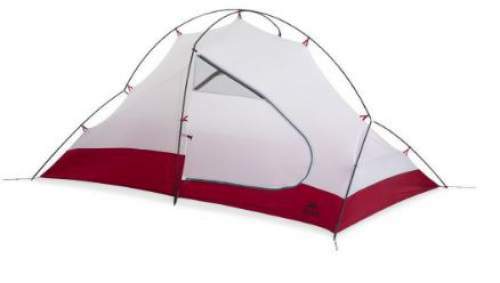 If you need a 3-season tent from the same brand, please see this MSR Elixir 2 tent. See in particular my list of winter tents for backpacking where this tent is also included. Thank you for reading. I hope the text has been useful to you. Please let me know if you have any question or comment, there is a comment box below. I am inclined to agree. Its very difficult to buy certain items like a tent without trying them or even seeing one erected. Maybe I should not discard the solo versions either. No problem. Yes, the solo version is with a vestibule so you have a place to put your gear. I wonder if you have ever considered tent-cots? See some here, though these are not winter tools. But sleeping off the ground is a totally different experience. Correct I would use the tent all year round apart from maybe in the summer when bivying makes more sense. I stuck between the Hubba Hubba nx and access 2. The durability of the access sounds good, however the additional venting through the use of more mesh found in the NX might prove helpful when the temperature rises. There is roughly 200 grams difference between the access and nx. I have considered buying a solo tent. however I think the weight penalty of a two man tent over a solo tent is well worth it, maybe 200 grams difference. Both tents I have mentioned are quite light anyway compared to other manufactures. Both the two man tents have a double vestibule which aids venting over the solo tents. I think I would go for the Access 2 tent. This is a better option when it is cold, it will be better for your environment. I am looking to buy a new tent, I own and use a Force Ten MTN 2 tent which is verging on a 4 season tent. It weights about 3.5 kg which is carried and divided between two people, it provides good accommodation in all weathers. I am looking for a tent which I can carry solo. I have been looking at the Access 2 and the Hubba Hubba NX but not sure which one to buy. I will mainly use the tent in mountainous areas of the UK such as Wales, Scotland etc. I prefer the sound of the Access 2 due to the Easton Poles and greater strength in adverse weather but it might prove to be a little warm in the summer months. What would you recommend? Hi Bert, the Access 2 is a double-layer tent and you will be fine with it. As I understand you would use it in all seasons, then it is better than a typical single layer tent. Though I wonder why not the Access 1 if this is for solo use. I made a list of winter tents just to know if you have missed it.